I just wanted to thank you in writing for the outstanding job you did sealing our driveway and express how much I appreciated your honesty when working with us. 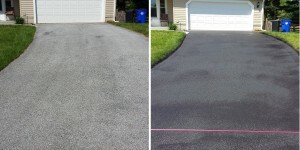 To suggest that we not seal the driveway last year until needed repairs were completed, then come back in the spring to seal the entire driveway ensuring the longest lasting repairs, impressed me. Your prompt and professional service is top notch. I will not hesitate to suggest your services to any of my family, friends and business associates and please feel free to use me as a reference. I just wanted to let you know how very satisfied we are with the excellent driveway sealing job you did for us recently. We appreciate the completeness, neatness, and overall high quality of materials and workmanship. I’m really happy. We had seen the work you did from one of our neighbors and signed up with you. We used another local provider to seal our driveway prior switching to PJ’s Driveway Sealing. I felt like I was on a resealing treadmill as we needed to reseal every other year. Initially, I thought this was normal but at $140 ever other year I needed a better option. It has been almost 3 years since Paul sealed our driveway and it looks like the job will last another three years. Paul did a fantastic job at a fair price. We look forward to giving him business again in the future as do all our friends, family and neighbors in the general area. I could not believe the longevity of the application and the street appeal of my property. Paul brings an old-fashioned work ethic and clearly focuses on customer service. Two years ago, I requested that he reseal my driveway; however, he informed me that the driveway had at least another year of life before it needed to be resealed. Last fall, I had PJ’s Driveway Sealing seal my driveway for the second time in 6 years. Unyielding ethics and an innate ability to provide customers with what they need, when they need service. I will hire PJ’s Driveway Sealing again in 5-6 years! !